They say an apple a day keeps the doctor away. Well, you won’t find any apples on the reels of Fruit Shop by Net Entertainment, but there are plenty of other fruits to keep you going. Fruit Shop slot has a simple design but comes with an attractive set of features which make the gameplay interesting. Thanks to the free spins feature, you will keep playing this game for hours and hopefully, you will reel in some big wins. 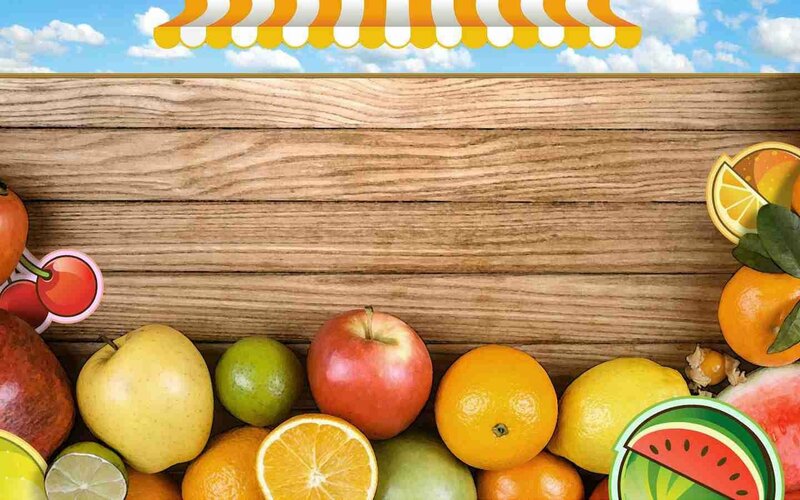 Let’s take a closer look at what Fruit Shop has to offer. Fruit Shop is a 5-reel, 3-row, 15 payline video slot. As you may already have guessed from the slot name, this game has a fruit theme and it’s up to you to gather the most fruit you can at the fruit shop. The design and symbols are really simplistic and certainly don’t have the details you will find in many other NetEnt slots. Irrespective, the visual details are good and match the theme. The reels are set in what appears to be a shop window or kiosk in front of green fields. The 15 paylines are fixed, so once you decide to play the game, all you need to do is adjust the coin size and bet level, and then hit the Spin button. This slot is all about free spins that can be triggered on every winning spin. This way players have a chance to score some nice payouts, thanks to the free spin’s multipliers. Ready for your daily fruits? Read on to learn more. Fruit Shop has 10 regular paying symbols. The highest payout in the game comes from the Cherry symbol. If you manage to land 5 of them on a winning payline, you will be rewarded with a 2,000 coins payout. The rest of the high tier symbols are also fruit symbols represented by the Plum, Lemon, Orange, and Melon. The low tier symbols in Fruit Shop are the card symbols which can range from 10 to A. Fruit Shop is also one of the few video slots which don’t have a Scatter or Bonus symbol. The only special symbol in the game is the Wild Fruit Shop symbol, which obviously substitutes for all other symbols and multiplies all line wins by x2. Fruit Shop does not have a dedicated bonus game, like revealing hidden value etc. Don’t let this put you off playing Fruit Shop as the wilds and the opportunity to win plenty of free spins makes up for this. The Free Spins are triggered by getting a winning combination with any of the fruit symbols. All payouts during the free spins will be doubled in size, so this means that all wins with a Wild symbol will have a x4 multiplier attached. The number of free spins which are awarded after a win depends on which fruit symbol created the win and how many symbols are involved. If a win is formed with 2, 3, 4 or 5 Cherry symbols, the player will get 1, 2 or 5 free spins respectively. All of the other fruit symbols will award 1, 2 or 5 free spins for a win with 3, 4 or 5 fruit symbols. An indefinite number of extra free spins can be won during the free spins round. The best part about the free spins bonus is that you will get extra free spins for all wins formed with any of the card symbols as well. So, if a win is formed with 3, 4 or 5 card symbols, you will get an extra 1, 2 or 5 free spins accordingly. The free spins bonus in Fruit Shop is what makes this slot so attractive. Players can easily end up with 20, 30 or more free spins in one round, which is an almost guaranteed big payout on their account. Fruit Shop doesn’t have any dedicate jackpots or progressive jackpots. As mentioned, the opportunity to win free spins regularly combined with the x2 multiplier means there is the possibility of some seriously big wins. The number of paylines in Fruit Shop is fixed and is set at 15. The RTP value in Fruit Shop is set at 96.7%, which is a relatively high RTP value for a video slot game. Fruit Shop is a medium variance slot. 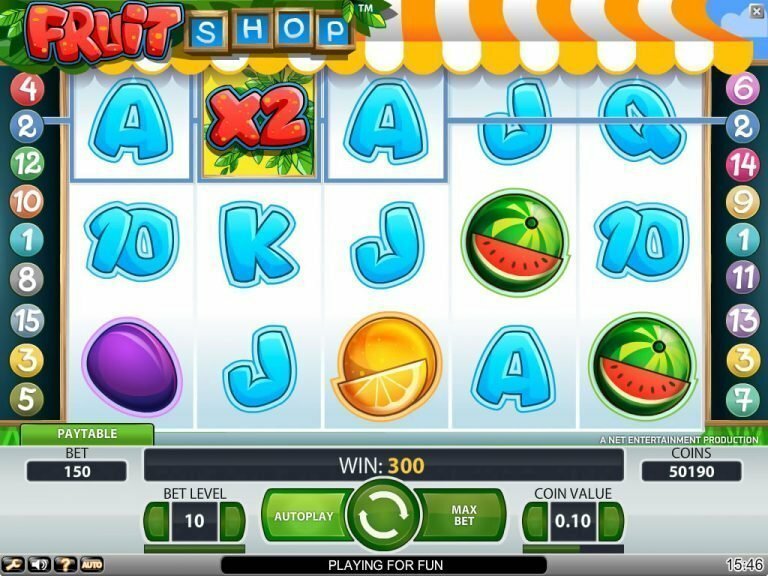 Fruit Shop is an older, but still very popular video slot coming from Net Entertainment. The game has a simple design and doesn’t look like a serious slot at first look, but it has more to offer than meets the eye. The most attractive part of the game is the free spins bonus which is activated on every winning spin with a fruit symbol involved. After that, all you need to do is keep spinning, keep winning and keep increasing the free spins count and payouts. Maybe a fruit a day can keep the doctor away, especially if you’re winning big! Take Fruit Shop for a spin right now at Casumo!